After getting our feet wet with some of the climbs near Mammoth and getting acclimated at altitude it was time get on with some serious climbing. After-all, the objective of the Cycling Camps San Diego (CCSD) high altitude camp is to prepare you for two major events, Everest Challenge and the Furnace Creek 508. Let’s briefly describe these events. Everest Challenge has 29,000 feet of climbing in a two day format. The Furnace Creek 508 is 508 miles with 35,000 feet of climbing in a non-stop Ultra race format. Above are the two days of Everest Challenge. On Day 1 of Everest Challenge we climb Mosquito Flat then Pine Creek then finish off with South Lake. In training, unless you are a glutton for punishment, there is no real need to do all three climbs in one day to feel that you are preparing yourself properly for Everest Challenge. I have come out to Big Pine and Lone Pine on several occasions (here and here) and done just two out of the three, Pine Creek and Mosquito Flat. The main reason is the climb to South Lake is boooooring. It is on a main road and if you do two miles of it you have done 10 miles of it. It’s all the same and in my opinion and not worth the trouble. Another climbing day at altitude and another long warm-up. I was also a still dehyrdrated from the day before. I felt I didn’t refuel enough either. We began our route at Tom’s Place and descended down into Rovana to begin our first climb, Pine Creek. As you can see on the graph below Pine Creek is a good steady climb. It progressively gets steeper but then after mile six there are a few dips which makes the last push to the top a little easier. From the top of Pine Creek to the summit on Mosquito Flat I took on five bottles of fuel and water- more than I have EVER taken on this climb. By comparison, when I come out to do this climb unsupported I take three bottles. Furthermore, on race day I make it up this climb on two bottles. 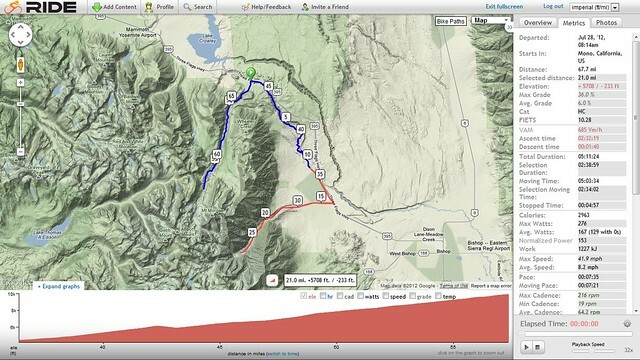 I good long climb of 21 miles where you gain almost 6,000 feet in one climb!! I felt very well supported by CCSD. 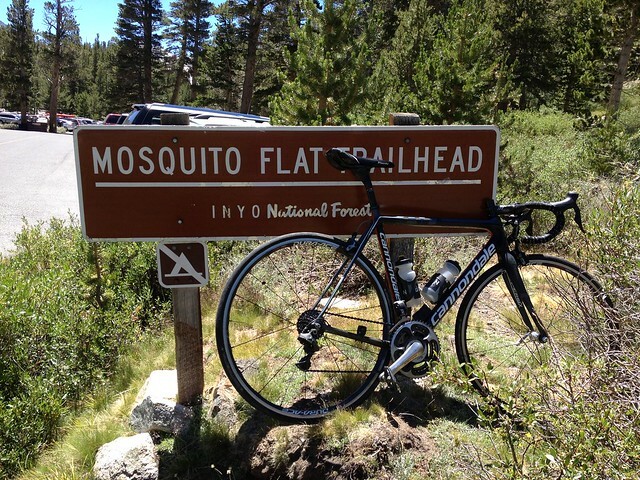 I continued to take on water and fuel and made it to the top of Mosquito Flat. Wow what a day!!! Mosquito Flat- Is the highest paved road in California and so tops out at 10,250 feet. It’s a good long climb of 21 miles where you gain almost 6,000 feet in one climb!! I felt very well supported by CCSD. I continued to take on water and fuel and made it to the top of Mosquito Flat. Wow what a day!!! As you can see below Mosquito Flat ranks in several of California’s top ten lists! This entry was posted in CCSD - Cycling Camps San Diego, Mountains, Training by REV Cycling Directeur Sportif. Bookmark the permalink. Are you doing Everest this year? Or training for the 508?